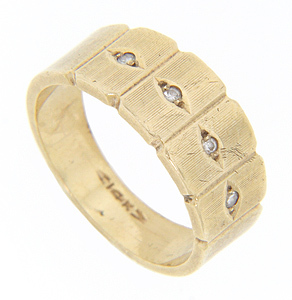 Four diamonds ornament the top of this 14K yellow gold vintage wedding band. Each diamond is set in an eye shaped design that in turn is inside a rectangular outline. Lines perpendicular to the ring’s edges add texturing. The wedding ring measures 7.7mm in width. Circa: 1950. Size: 6. We can resize.